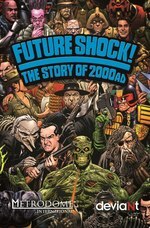 Documentary covering the highs and lows of British comic 2000AD's history, from its inception after the demise of Action to the present day. Which I suspect I will have to import from the UK. I have no idea if this is on the DVD, but there's a fan Q&A for it. All I know is that there is a DVD shaped present under the Christmas tree, further reports may have to wait a week or so.